Ruby Mendenhall discusses a point during a meeting last spring with collaborators on an art exhibition, one of her many interdisciplinary projects. CHAMPAIGN, Ill. — Ask Ruby Mendenhall about the scope of her activities, and you’re quickly overwhelmed. Ask her to illustrate how they all connect, and you’ll soon have a page full of circles, lines, themes and projects – many of them connecting people you’d think would have little to talk about. Yet they do. Mendenhall is a professor of sociology and of African American studies, disciplines that guide her core concerns: poverty and racial inequality, black lives past and present, and black women’s lives in particular. In recent years, her prime focus has been on black mothers living with the threat of gun violence in the Chicago neighborhood of Englewood, and the toll that takes on their mental and physical health. Some have lost children and others fear they will. In pursuing those interests, however, Mendenhall ranges far and wide, crossing many academic borders, seeking interdisciplinary connections and affiliations. She is willing to work with anyone in any field, be they a genomic biologist, a computer scientist, an art professor or someone who can arrange study abroad. If experts at the Carl R. Woese Institute for Genomic Biology (IGB) can help determine how stress “gets under the skin” of women living with the fear of gun violence, she’s interested. 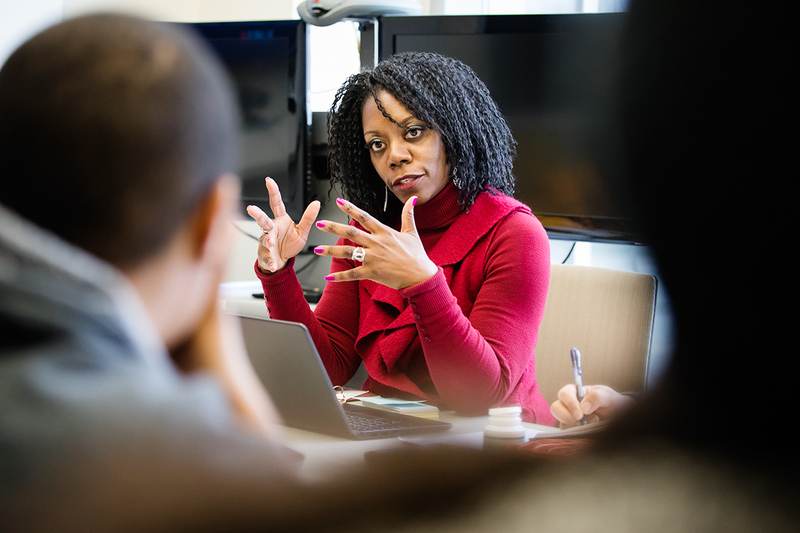 If researchers at the National Center for Supercomputing Applications (NCSA) can help recover the lost history of black women from digitized historical documents or combine data from fitness trackers and crime location technology to study the effect of crime on women’s health, she’s all for that. If artists can help communicate something essential about the lived experience of these same women for an exhibit, or colleagues and staff can arrange courses in Ghana or France to help students connect with and understand “other Englewoods,” she’s for that, too. These are not all studies or activities that Mendenhall leads, but she’s involved in one way or another – by initiating, inspiring, supporting, working with student researchers or just being open to opportunities. One such opportunity brought her back to school to take genomics-related courses as part of the Study in a Second Discipline program for faculty. Another brought her recently to the new Carle Illinois College of Medicine as an assistant dean, where she hopes to play a part in the school’s research, curriculum, community outreach and recruitment. Mendenhall grew up in Chicago and earned her first degree in occupational therapy, then went to work at Cook County Hospital in pediatrics. There, she saw many children with stunted growth, and remembers first wanting to question their mothers’ care. But then she heard repeatedly that these mothers could barely afford formula and thus watered it down. They also kept their children from playing on the floor for fear of rats. She grew to question the system and public policies behind those conditions. Another degree followed, in public policy from the University of Chicago, followed by work in public housing, where she witnessed how gang violence could affect the everyday lives of the residents. Then came a Ph.D. in human development and social policy from Northwestern University. Then her arrival at Illinois in 2006. The sociology department head recommended he connect with Mendenhall, already interested in taking multidisciplinary approaches to studying stress and resilience in the women of Englewood. In one resulting study, they surveyed and interviewed about 90 women and also drew their blood to study how stress might be affecting their genome. To involve Englewood mothers in the research as “citizen scientists,” Robinson, Mendenhall and others have been developing a short course called Genomics for You. Other such projects followed, with other researchers, often brought together through additional initiatives to promote interdisciplinary research. Out of those developed two umbrella programs that encompass much of what Mendenhall and her collaborators are working on in Englewood and beyond: DREAM, for Developing Responses to Poverty through Education And Meaning, and De.SH(ie), for Designing Spaces of Hope (interiors and exteriors). Making such projects work across academic borders, Mendenhall said, often requires significant meeting time for finding where research interests connect, learning each other’s language and coming to understand the lived experience of those who will be the subjects of the research. Just the experience of collaboration can be a motivator. Mark Van Moer’s previous work was about as far as one could get from Mendenhall’s. A visualization programmer at NCSA, he’d previously developed scientific visualizations of things like fluids and black holes. But he learned about Mendenhall’s big data project to recover black women’s history from documents of previous centuries, and he signed on. Kiel Gilleade, a research programmer at NCSA, was pulled into the fitness tracker project when he learned at a networking event that Mendenhall was in need of someone with his expertise in biosensors. “Looking at social issues sounded really attractive,” he said, and he was particularly troubled by gun violence. The project also fit his interest in moving from lab settings on campus to applied work in the field, and in tackling the challenges that came with that. This study would run for 30 days in a city two hours away and involve a population without easy access to technology beyond their phones. Christy Lleras, a professor of human development and family studies, has been a key part of DREAM and De.SH(ie) since meeting Mendenhall at an interdisciplinary event several years ago. For her, there hasn’t been much of a border to cross. Trained as a sociologist, Lleras believed in applied research and had worked on public policy around desegregation and other issues. She’s also motivated by the style of the research they’re doing, which involves buy-in, outreach and follow-through with the community, in contrast with “extractive research” that involves just going in, collecting data and leaving. Malaika McKee, a visiting professor of African American studies and also a key part of DREAM and De.SH(ie), said she clicked with Mendenhall almost immediately when they first met. In part, she thinks, it was due to their mutual love of dance, which is Mendenhall’s primary passion outside of her work and family. McKee also thinks that dance, for Mendenhall, “very much informs her world view.” Dance “is all about a poetic expression of the body,” she said, and she notes that Mendenhall often starts with the body when talking about the mothers of Englewood and the effects of stress. Mendenhall also relates to those women as a mother herself, with two black sons, saying she might be preoccupied with worry if living in similar circumstances. She also knows these are women on the margins who often do not have a voice. "We can change this as a country and we must." Editor’s note: This story also appears, under a different headline, in the 2018-19 edition of On Campus, a guide to the U. of I. campus.